Because plants don't have legs. 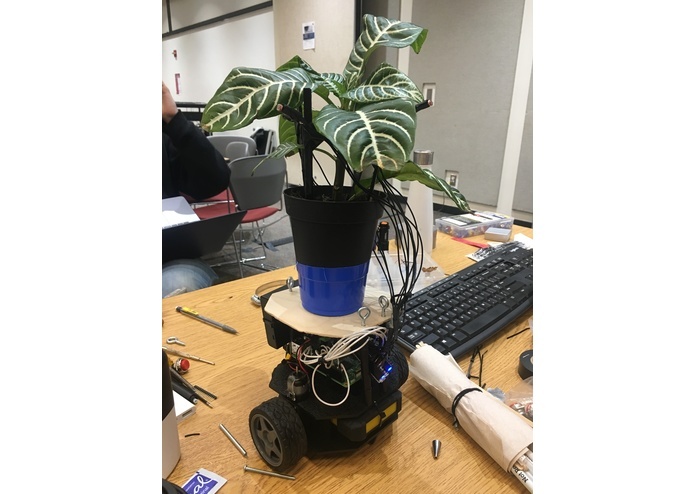 Photo-Rover is commanded by web server over wifi containing scripts which control the motor and photo-cell sensors.... with a plant on it. The plant's objective is to drive itself to the strongest light source near by. 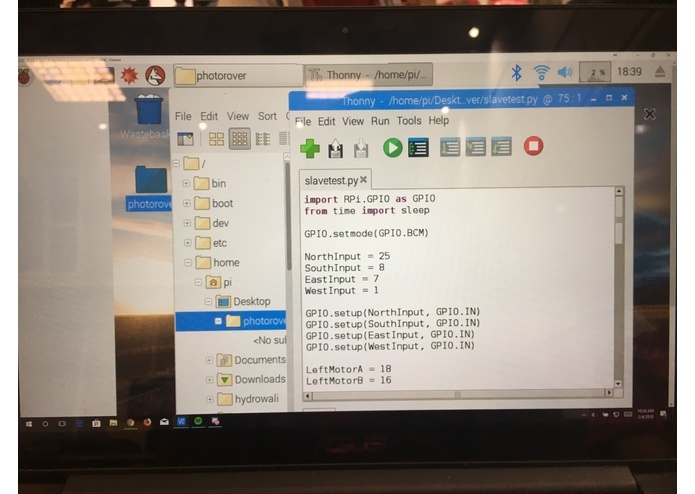 We used a raspberry-pi, arudiono-nano, motor controller, two motors, 4 photo-cell sensors, two battery packs, and a flask web server containing html, python, and java-script which communicates with Photo-Rover over wifi. Putting together all of this different technology was our biggest challenge. It was a big, fun puzzle. We ran into time constraints on finalizing the web server into a nice interactive website where we can see real-time data of the direction and light of the robot; also it would of gave us the option to control it manually. Making more improvements to the point where Photo-Rover can live all on it's own for ever... as long as light exists. Configured the initial OS for the raspberry-pi, created/hosted the web server, contributed coding the python scripts controlling Photo-Rover, contributed physically wiring/soldering the hardware, contributed to laying out the hardware and software requirements as well as gathering the necessary hardware and software used, solved all arising information assurance regarding the robot's network, web-service, and remote access. Provided leadership capabilities and a development process using agile methodology. Ensure all members to stay on task to fulfill each Sprint and support in assembling the hardware together. performed quality check and testing. Designed and constructed the raspberry-pi, Arduino, and Sensor circuits. Programmed the motor control python script and Arduino sensor monitoring code. Developed webpage UI and api backend.